I was recently invited to be a member of the Truvía® Kitchen Cabinet Ambassador Team! What does that mean? It means we’ll able to enjoy a delightful Truvía® recipe every month! Truvía® Strawberry Yogurt Pops and A Sweet Future because every good cause needs a tasty treat to go along with it! 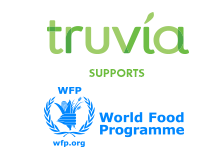 On World Food Day 2012, the Truvía® brand joined with the World Food Programme to launch Sharing a Sweet Future. Now in its third year, nearly $1 million in contributions from the Truvía® brand has been used to help develop sustainable communities in Bolivia, a region of critical need with one of the highest rates of nutritional deficiencies in South America. In 2013, members from the Truvia® business travelled to Bolivia to meet the schoolchildren the Sharing a Sweet Future initiative is helping feed. The World Food Programme documented their trip in photos here. If you are interested in finding other ways to help people in Bolivia, click here to learn about a U.S.-based NGO called Mano a Mano that provides multiple ways to get involved. AND now for the tasty sweet recipe part of this post! Combine first 3 ingredients in blender, pulse until smooth. Put 1-2 slices of strawberry into bottom of popcycle mold. Fill popcycle molds half way with blender mixture, freeze 15 minutes. Remove and add 1 tsp greek yogurt to each mold, additional strawberry slice, then top off with blender mixture to fill line. Insert wooden stick, freeze until solid (approx 2 hours).